For other people named Peter Reid, see Peter Reid (disambiguation). Peter Reid (born 20 June 1956) is an English football manager, pundit and retired player. A defensive midfielder in his playing days, Reid enjoyed a long and successful career. He built his reputation as one of England's brightest midfield talents of the time at Bolton Wanderers, before signing for Everton in 1982. It was there that he enjoyed the most fruitful spell of his career, as he helped the club win domestic and European honours, including the Football League twice. He was voted as the PFA Players' Player of the Year in 1985 and came fourth in the World Soccer Player of the Year award, behind Michel Platini, Preben Elkjær and Diego Maradona. He also received his first senior England call-up that year, and represented his country at the 1986 FIFA World Cup and 1988 UEFA European Championship. He won 13 caps in total. Reid joined Queens Park Rangers in 1989, but moved on to Manchester City a year later to begin his managerial career. He was appointed manager of Coventry City in 2004 but his tenure lasted less than a year. He then worked as a pundit for the BBC at the 2006 FIFA World Cup, and also worked for Sky Sports and ESPN before returning to management with Thailand in 2008. He won the T&T Cup with the country before returning to England as assistant manager to Tony Pulis at Stoke City, and helped them to an eleventh-place finish in the Premier League. He then managed Plymouth Argyle, taking over in June 2010, but was sacked after just over a year at the Devon club. Reid signed professional forms with Bolton Wanderers in 1974. He first won a medal when Bolton won the championship of the Football League Second Division in 1978, but he only enjoyed two seasons of First Division football before Bolton were relegated. He was transferred to Everton for a cut-price fee of £60,000 in 1982 only 12 months after a much larger fee had been mooted – a succession of injuries had cut the price. At club level his greatest achievement was as part of the Everton team that in 1984 won the FA Cup, in 1985 and 1987 the Football League championship and in 1985 the European Cup Winners' Cup. They nearly won a unique treble but lost 1–0 to Manchester United in the 1985 FA Cup final. In that game, Reid was recklessly challenged by Manchester United defender Kevin Moran who became the first player to be sent off in an FA Cup final. He was voted PFA Footballer of the Year in 1985, the same year that he collected a Football League title and European Cup Winner's Cup winner's medal. Reid's form was so good that year, he came 4th in the World Soccer player of the year award behind only Michel Platini, Preben Elkjaer and Diego Maradona. He made 167 appearances (eight as substitute) for Everton. In 2006, Reid was awarded with the 'Everton Giant' accolade. Reid won 13 caps for England. Given his chance by the injuries to other players, he became the linchpin of the England team in the 1986 FIFA World Cup in Mexico. In the England v Argentina quarter-final at that tournament Reid was one of the England players left behind by Diego Maradona as he burst from inside his own half to score his second goal. Reid signed for Queens Park Rangers on a free transfer in 1989 but only stayed for one season (1989–90) before signing for Manchester City, who were managed by former Everton manager Howard Kendall. Reid's managerial career began on 7 November 1990 at Manchester City, when was appointed caretaker manager after the departure of Howard Kendall back to Everton. Reid was appointed player-manager on a permanent contract on 15 November. In 1990–91, Manchester City finished fifth (one place above neighbours Manchester United) and equalled this achievement the following season. In the first season of the Premier League (1992–93), City slipped into ninth place with an increasingly stale brand of 'long ball' football and Reid was sacked after a poor start to the following season. Reid bought Keith Curle and Terry Phelan for £2.5 million each. Colin Hendry was sold to be eventually replaced by Michel Vonk. Clive Allen was also sold in December 1991. Following his dismissal by Manchester City, in October 1993 Reid was persuaded by Ian Branfoot to resume his playing career with Southampton who were then in the middle of a crisis: the Saints fans were calling for Branfoot to be sacked with the club having lost eight of their first nine games. Reid brought a touch of guile and stability to the Saints side; despite playing only eight games he made a major contribution to the team's fortunes as Saints' season started to come together. He led them to some important victories, most specially over Newcastle United on 24 October 1993, a game in which Matthew Le Tissier scored two goals. His final game for Saints was a 3–1 victory over Chelsea on 28 December 1993. Branfoot was sacked a few days later (after a home defeat by Norwich City). Reid was touted as a possible replacement for Branfoot, but he stated that, as Branfoot had brought him to the club, it would only be fair that he left as well. Reid then had brief playing spells with Notts County and Bury before he retired from playing. Reid made his return to management in March 1995 with Sunderland, who were battling relegation in the First Division. He kept the club up, and the following season they were crowned champions of the division and were promoted to the Premier League. In 1996, a group of Sunderland fans operating under the name Simply Red and White had a top 50 hit with the song Cheer Up Peter Reid – an altered version of the song Daydream Believer. The team was relegated back to the First Division at the end of the 1996–97 season, after losing their last match of the campaign at Wimbledon. Sunderland missed automatic promotion by one place in 1997–98, and drew 4–4 with Charlton Athletic in the Division play-off final. Reid's side missed out on promotion after losing 7–6 in a penalty shoot-out in one of the most dramatic games ever seen at Wembley. The following season Sunderland bounced back from this defeat, winning the First Division with a then-record breaking 105 points. Throughout 1999–2000, Sunderland were competing for a place in European competition but in the end missed out after finishing in seventh place, one of the highest finishes ever achieved by a Premier League team in the season after promotion. Striker Kevin Phillips was the highest league scorer in England and Europe with 30 goals in the Premier League, and therefore won the European Golden Shoe that season; he is the last Englishman to win the accolade to date. Reid also had a brief spell as manager of the England under-21 team in this season. For a while in 2000–01, Sunderland were second in the league and it looked as though they would secure qualification for the UEFA Champions League, but their form dipped in the final stages of the season and again they finished seventh. Reid's team suffered a downturn in the 2001–02 season ending up one place above the relegation zone and with just 28 goals from 38 games – fewer than any other team in the division. In a bid to halt the decline, Reid paid a club record £6.75million for Norwegian striker Tore André Flo from Rangers but was unsuccessful. Reid was let go in October 2002 after nearly eight years as Sunderland manager. Following his sacking from Sunderland, Reid was linked with the Republic of Ireland managerial position. He had even planned to apply for an Irish passport through his Drumcondra family connections. In March 2003 he was appointed interim manager of Leeds United after the dismissal of Terry Venables. The Elland Road club had been hit by £80 million debts after their £100 million outlay on new players in the space of five seasons had failed to land them a trophy. Reid looked to be the man to reverse the decline, especially after a 6–1 away win over Charlton Athletic and a 3–2 away win over Arsenal which ended the opposition's title hopes. After keeping Leeds up, he was awarded the job on a permanent basis. Leeds were still in a poor financial state and Reid was forced to sell Harry Kewell and bring in cheaper signings from abroad as replacements. His new signings failed to gel and he was sacked in November 2003 after a 6–1 defeat against newly promoted Portsmouth. Although many of his signings left Leeds after the club was relegated, Kevin Blackwell, who Reid had brought to Leeds as assistant manager, later went on to become manager in 2004. Reid was appointed manager of First Division side Coventry City in May 2004 with the aim of getting the club promoted to the Premier League. His spell at Highfield Road lasted only eight months as he departed on 6 January 2005 with the club 20th in the Championship. In late 2006, it was rumoured that Reid would be returning to Sunderland as Director of Football under new chairman Niall Quinn, who had played under Reid at Manchester City and Sunderland, but this appointment never happened. After an absence from management of nearly four years Reid became manager of Thailand in September 2008, having been linked with the position earlier in the year. He signed a four-year contract with an aim of qualifying for the 2014 FIFA World Cup. He admitted to not knowing much about Thai football, and referring to his players by squad numbers rather than their Thai names. Reid said "I was surprised by the players' ability and I'm learning things about football I'd never have learnt in the Premier League. It's great for my football education. This is pure football and I love it." Reid's first assignment as the new national coach of Thailand was to take part in the T&T Cup in Vietnam, a three-team round-robin tournament with hosts Vietnam and North Korea. Thailand beat North Korea in the first game of the tournament and then went on to draw with Vietnam to clinch the championship. On 9 September 2009, the Thailand Football Association (FAT) announced that Reid had left his position as manager; his contract was terminated by mutual consent after a year in charge. After Reid left the Thailand job on 10 September 2009, Stoke City confirmed his appointment as assistant manager. On 24 June 2010, Plymouth Argyle confirmed the appointment of Reid as manager. Reid endured an unexpectedly turbulent time with the Pilgrims who had just been relegated from the Coca Cola Championship. The club was hit with two winding-up petitions from HMRC in November, and was forced to sell star players Bradley Wright-Phillips and Craig Noone in the January transfer window. Reid himself even auctioned off his FA Cup runners up medal and paid the clubs heating bill at one point. Despite these efforts the club was docked 10 points for intention to enter administration in February 2011 and left Argyle bottom of League 1 with relegation seeming inevitable. The clubs relegation to League 2 was confirmed on 2 May 2011 following a 3-1 defeat to Southampton, with the club finishing 23rd in League One. Reid was forced to sign an almost entirely new team over the summer of 2011, with 10 players making their debut on the opening day in a 1-1 draw with Shrewsbury Town. However the club were unable to build on the Shrewsbury result and lost their following 8 league games, all whilst the club was still stuck in financial turmoil. 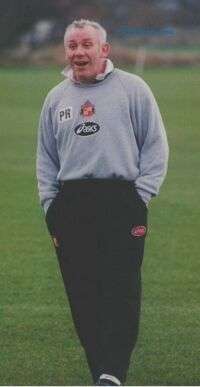 On 18 September, Peter Reid was sacked by acting chairman Peter Ridsdale with the club bottom of the Football League with just one point. Despite having a win rate of just 26% during his time at the club, Reid remains popular amongst Plymouth Argyle supporters because of his generosity and commitment during troubled times. On 4 September 2014, Reid was appointed manager of Mumbai City FC ahead of the inaugural Indian Super League season. On 18 March 2016, it was announced that Reid had returned to his first club Bolton Wanderers in a coaching capacity to assist interim manager Jimmy Phillips. He left at the end of the season. ↑ "Peter Reid". BBC Sport. 14 May 2002. Retrieved 10 September 2010. ↑ "Archived copy". Retrieved 17 April 2011. ↑ "Peter Reid | Latest Betting Odds". Soccer Base. Retrieved 28 March 2016. ↑ Holley, Duncan; Chalk, Gary (2003). In That Number – A post-war chronicle of Southampton FC. Hagiology Publishing. pp. 569–570. ISBN 0-9534474-3-X. ↑ "FOOTBALL: CITIZEN REID; He Will Apply for Irish Job – and passport!". Sunday Mirror – via HighBeam (subscription required) . 10 November 2002. Retrieved 10 February 2014. ↑ Chase, Graham (10 July 2008). "Peter Reid to be named Thailand manager". London: The Daily Telegraph. Retrieved 10 July 2008. ↑ "Reports: Thailand To Unveil Reid This Month". www.goal.com. 10 July 2008. Retrieved 10 July 2008. ↑ "Reid confirmed as Thailand boss". BBC Sport. 2 September 2008. Retrieved 2 September 2008. ↑ Bright, Richard (10 February 2009). "Peter Reid happy to coach by numbers in Thailand". The Daily Telegraph. London. Retrieved 22 May 2010. ↑ "Archived copy". Archived from the original on 26 August 2010. Retrieved 5 March 2009. ↑ "Reid named Stoke assistant boss". BBC Sport. 10 September 2009. Retrieved 10 September 2009. ↑ "New Stoke assistant Peter Reid steps down as Thailand national coach". The Guardian. London. 9 September 2009. Retrieved 10 September 2009. ↑ "A Good Reid". Plymouth Argyle F.C. 24 June 2009. Archived from the original on 28 June 2010. Retrieved 24 June 2010. ↑ "FA replaces Reid cup medal sold to help Plymouth Argyle". BBC Sport. 26 October 2011. Retrieved 15 November 2014. ↑ "Plymouth Argyle are deducted 10 points". BBC Sport. 21 February 2011. Retrieved 15 November 2014. ↑ "Plymouth 1-3 Southampton". BBC Sport. 2 May 2011. Retrieved 15 November 2014. ↑ "Shrewsbury 1-1 Plymouth". BBC Sport. 6 August 2011. Retrieved 15 November 2014. ↑ Riach, James (8 September 2011). "Plymouth Argyle announce departure of manager Peter Reid". The Guardian. Retrieved 18 September 2011. ↑ "Peter Reid to manage Indian Super League side Mumbai FC". BBC Football. 4 September 2014. Retrieved 4 September 2014. ↑ "Peter Reid joins backroom staff for remainder of season". Bolton Wanderers FC. 18 March 2016. Retrieved 18 March 2016. ↑ "Peter Reid departs". Bolton Wanderers FC. 17 June 2016. Retrieved 17 June 2016. ↑ "Peter Reid's managerial career". Soccerbase. Retrieved 7 August 2010.